As stated previously, there are a multitude of verses in the New Testament concerning logos/rhema that are worth your study; but I did not want to overburden you. If you are a true student of the Word, you will know how, or you will find a way, to dig deeper into this very important topic. There is nothing SPECIAL about rhema apart from the scriptures as we have them. that understanding rhema to be something special or magical is simply not accurate. by using scriptures that rhema and logos are essentially synonymous. that a true rhema word will be the revelation and remembering of a scripture to the heart/mind/soul of a person. that logos is not dead letter in and of itself. that logos can also be the spoken word. Finally, I want to show why understanding rhema to be something special apart from the revealed Word of God in the Bible is very dangerous. What Scripture says, God says. That means I don't need another word from God before I believe or obey His Word in Scripture. But if it's in Scripture, then the Holy Spirit has spoken to you about it! You don't need to wait for a so-called "now" word; you have the everlasting Word of God in the Bible. The Sufficiency of Scripture means that, in the Bible, we have everything we need for salvation and godliness. That means we don't need a "fresh" word to tell us what we need for godliness in Christ; we already have it in Scripture. God has not left us in the dark, waiting until a rhema comes along to enlighten our path. No, He is not a God who doles out little portions of grace or illumination now and then, but rather a God who has lavished His super-abundant grace on us in Christ Jesus, and in His loving grace He has given us more than we need for each moment in His Word, the Scriptures. This time it's not so much the waiting for a rhema-word that's the problem, but rather just the idea that we need this teaching in the first place. Now any idea of "secret knowledge" should, of course, put us on our guard; needing secret knowledge is gnosticism, not Christianity. But perhaps even more fundamentally, this undermines the clarity of Scripture - it tells Christians that they can't understand the Bible without someone coming along to show them secrets. And that is a very dangerous idea indeed! If we need a "now"-word, a "rhema"-word, to hear from God and know His power at work here and now, then what does that say about the power of God's Word in Scripture? (Heb. 4:12) And this is a fundamental question. For, you see, my ministry as a pastor and teacher relies upon, and must rely upon, the fact that God's Word is powerful to do its work. I know that I don't have to rely on my own bright ideas or the latest marketing trend, because God's Word in Scripture is powerful. 'I simply taught, preached, and wrote God’s Word; otherwise I did nothing... I did nothing; the Word did everything... I did nothing; I let the Word do its work.' (Martin Luther, Sermon from March 10th 1522, LW 51:77). But if I have to wait for a fresh "rhema" word, then I can't have that confidence in the written Word to do its work. If I have to wait for a fresh "rhema" word, then the ministry no longer relies on the power of God's Word, but on my own ability to discern the "rhema" rightly. Suddenly it's all about me and how good I am at getting "rhemas", instead of all about Jesus and how good and gracious He is to us in the Scriptures. There's a fundamental directional shift that occurs when we buy into this "rhema"-word business. You see, Scripture, rightly understood, moves us in a very particular direction - out from ourselves to Jesus. All the Scriptures speak of Christ (Luke 24:27), and Jesus says that we cannot understand the Scriptures at all without seeing Him and coming to Him (John 5:39-40; 46-47). So Scripture both points us to Jesus and brings us to Jesus. The whole direction of Scripture is Christward! But this whole "rhema" business works in the complete opposite direction: it becomes about what I must do, and so drives me further back into myself (which is the opposite direction from Jesus!). God's "Word" (in this "rhema" understanding) becomes focused on me, instead of focused on Jesus. I have witnessed this way too many times. The fruit of this teaching is not good, and is responsible for the next danger in the list. 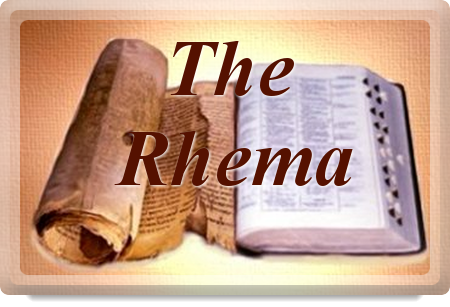 The "rhema"/"logos" distinction ends up elevating the supposed "rhema" over the "logos". Now, it might not always be expressed in those terms, but that's what it does. For the logos is seen to need a "rhema", otherwise it's so often thought of as simply words (often"dry words") on a page. True spirituality and true power are seen to come through the arrival of the "rhema". And so, understandably, whether or not it's expressed officially, in people's minds the rhema becomes the most important. But what is this rhema? It's a temporary and subjective thing. The written Word, however, is everlasting (Ps. 119:89) and objective. But more than that, the written word (and the proclamation of that Word) holds out to us Christ the living, eternal Word. Jesus is God's Word to us now and at all times. And no temporary, subjective experience can ever compare to Him. The true "now"-word which God is constantly speaking to us is Jesus. That's why true prophecy is the 'testimony of Jesus' (Rev. 19:10). That's why true preaching is proclaiming Christ biblically. That's why the Scriptures constantly turn us out from ourselves to Jesus. To elevate and chase after some temporary supposed "rhema" word at the expense of seeing Christ, God's "Yes"-Word, held out to us in Scripture, is folly, madness, and ultimately death. Christ is the Logos, and He is our life. And He constantly invites us, and appeals to us, to look to Him and live. So why would we look away to chase after something else? No, my friend, there is no need to seek for nor require a “rhema word” from the Lord in order to progress in your life with Jesus. The Bible, after all these centuries, still contains the words of God for you by which you may live a successful and Christ-centered life. It's refreshing to know that, "Rhema" doesn't have to be superior or sought after to live the Christian life but that it's part of the whole of scripture.